A black and white photograph of 227 Brock Street South. View is from the street looking north. The house located at 227 Brock Street South was the home and wagon building shop of Thomas McCann. He bought the original property, a Victorian clapboard house and large barn, c. 1871. When the wagon market slowed, the McCann family sold the large barn and lumber. In 1882 the family opened a grocery store on the first floor of their home. 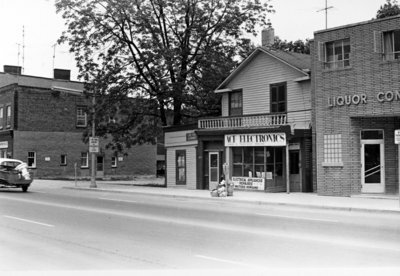 227 Brock Street South, Date Unknown, Brian Winters. Whitby Archives A2013_004_074.